Rowland Air is committed to excellence in all aspects of operations. When you partner with Rowland Air for HVAC installation, maintenance, repairs, and emergency services, you'll get the exceptional service born of over 20 years of experience, along with the peace of mind that comes with up-front pricing and a 100% guarantee for work. Rowland Air partners with top-quality HVAC brands to provide every homeowner with the best possible options for heating and air conditioning equipment. Our technicians offer expertise in the areas of installation, maintenance, and repairs to ensure you always enjoy peak performance, efficiency, and comfort. We're also committed to keeping our clients informed and helping them to make wise decisions where their HVAC is concerned. For this reason, we're proud to offer home energy audits, or assessments. What is a home energy audit and why do you need one? A home energy audit is an assessment of your structure intended to pinpoint areas of energy waste in order to provide data that helps you to improve overall efficiency. During a home energy audit, you can expect a trained technician to inspect your home from top to bottom in search of leaks that could drive up your heating and cooling costs. 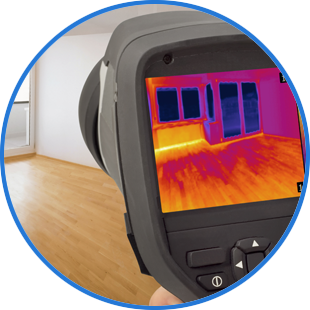 This will include a visual inspection, the use of thermographic imaging equipment, and a blower door test. Technicians will also ask to look at past utility bills in search of increases that could denote worsening issues with energy efficiency, as well as ask a variety of questions about your average HVAC usage. 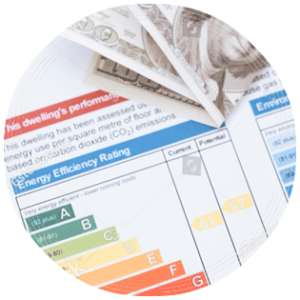 Following inspection, your home energy auditor will provide a report detailing areas of energy waste in the home. From there you can make repairs and upgrades that will improve efficiency and reduce costs. The Department of Energy estimates that the average household could save anywhere from 5-30% on energy costs by making changes recommended following a home energy audit. When air is leaking out around windows, doors, ducts, vents, pipes, and even the seams of your home, you could find yourself paying to heat or cool the outside. Even worse, you're likely compromising your own interior comfort in the process. When your home suffers from energy waste, it can not only be difficult to regulate interior temperatures, but you could be unnecessarily taxing your HVAC components and causing your furnace or AC unit to decline prematurely. A home energy audit can give you the information needed to implement repairs and upgrades that reduce your energy costs immediately and spare you from early system failure. Rowland Air is pleased to offer home energy audit and assessment services in addition to our exceptional installation and maintenance services. Contact us now at 800-500-9068 to schedule your home energy audit and pave the way to energy savings.